This lab teaches students about oxidation-reduction reactions through electroplating. Electroplating is a valuable industrial process that allows metals to be plated onto other materials using an electrical current. 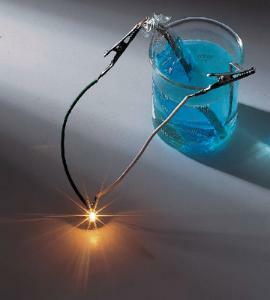 In this activity, an electrolytic cell is used to electrolyze a solution of copper (II) sulfate. A voltage source connects to two copper strips, and the strips are placed into the solution of copper ions. The energy from the voltage source causes a redox reaction to occur within the cell. At one electrode, copper (II) ions reduce to elemental copper, and at the other electrode, elemental copper oxidize to form copper (II) ions. When students measure the initial and final masses of the two electrodes, they can calculate the amount of copper that oxidized and reduced in the experiment. Ordering information: This lab includes copper sulfate pentahydrate, copper metal strips, and sulfuric acid solution. Ammeter, an analytical balance, a 150 mL beaker, a battery, a timer, a 100 mL graduated cylinder, isopropyl alcohol, wires, and alligator clips are required but not included.